If you love cooking, then it is important for you to begin building your cookware set. And don’t let financial constraints stop you; you can build your cookware set on a budget. When building your cookware set, you need to look for pots and pans that guarantee quick and even heating, because no one likes eating food that is only partially cooked. That’s where the Simply Calphalon 12 Inch Omelette Pan comes in. This pan promises you beautiful aesthetics, easy clean up, delicious results, and long lasting performance. While this premium quality pan is called an Omelette pan, it can prepare a variety of mouth-watering dishes including sauteed vegetables, hash browns, and bacon. 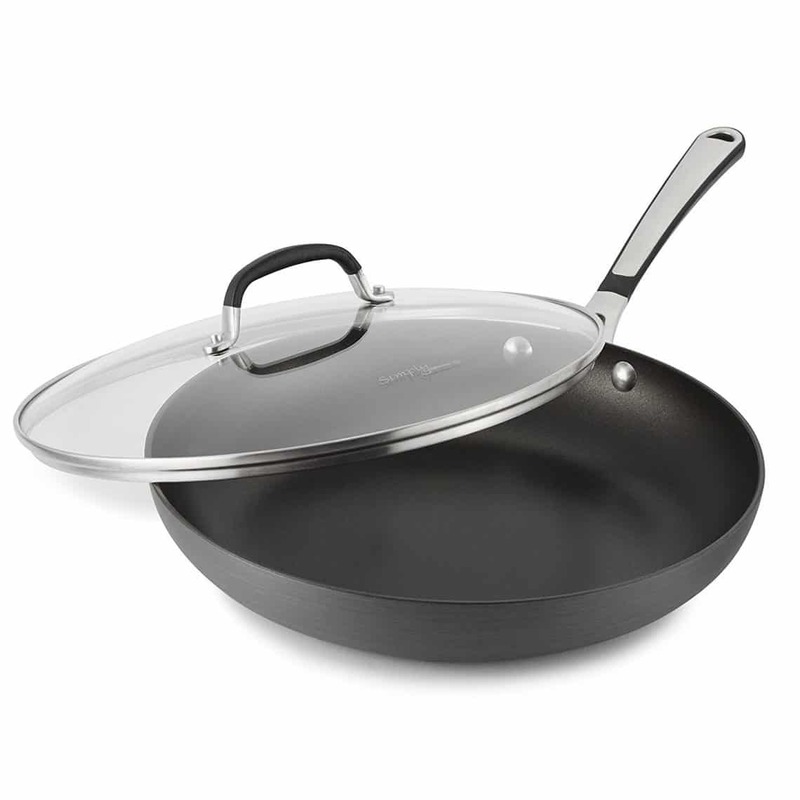 Simply Calphalon 12-Inch Nonstick Covered Omelette Pan is designed to meet the needs of the consumers. After hours of research, testing and analyzing the features, we put Calphalon is a one of the best in our cookware List. The Omelette Pan is an affordable pan that can cook a wide variety of meals. This pan is perfect for hash browns as well as other frying tasks, making it a must-have in your kitchen. The versatile pan is therefore the perfect cookware piece for novice cooks and skilled chefs, as it is composed of simple yet elegant features that everyone can appreciate. So if you are looking for a large and durable pan that can easily feed your large family, then you need to read on for a great review below. 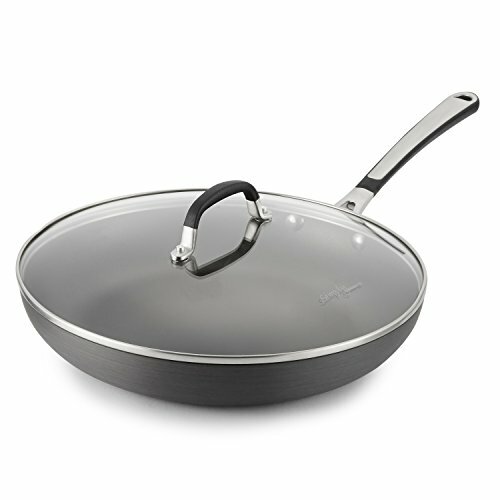 The 12-Inch non-stick Omelette Pan is constructed with hard-anodized aluminum which is common among Calphalon creations. This heavy gauge construction allows for amazing conductivity and even heat distribution, so that your food is always quickly and evenly cooked. 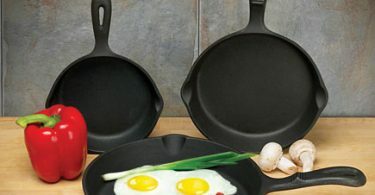 The solid pan is therefore perfect for cooking eggs, hash browns, chicken breasts, braised pork chops, and fried fish. No one likes it when their food gets stuck to the bottom of the pan, requiring you to scrape it off. That is why the Simple Calphalon 12-inch Omelette Pan has a double layer non-stick coating, which ensures that your food won’t get stuck to the pan. This coating is PFOA and PFTE free, which means that it won’t be harmful to your health. The reliable and sturdy Calphalon non-stick coating interior will not react with your food, and it also reduces the amount of oil and fat you use. This non-stick coating also means that your plating will be attractive, as your food will not be broken up into pieces. The Omelette Pan is also designed with a solidtempered glass cover. This glass cover gives you the chance to monitor your food as it cooks, so that all heat, moisture, and flavor is locked in. The classic cover therefore eliminates the need for you to constantly lift the lid of the pan when you are cooking. The Calphalon Omelette pan has a cast stainless steel handle which has been contoured for comfortable handling. This handle also has a silicone overlay, which means that it will remain cool while you are cooking. The handle therefore ensures that you have great grip as you are stirring, tossing, and flipping your food. Is the pan safe to use in the oven? Yes it is. The Simply Calphalon Omelette Pan is oven safe up to 400 degrees. What cooking surfaces can you use this pan on? 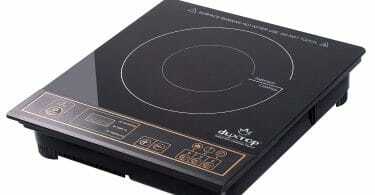 The Omelette pan is recommended for gas, electric coil, electric flattop, glassceramic, and halogen stovetops. However, it is not induction compatible. What type of utensils can you use with this pan? You can safely use nylon, wooden, and coated utensils with the Calphalon pan. Whether you like to cook frittatas, green beans, fried eggs, hash browns, braised pork, or fried fish, the Simple Calphalon Covered Omelette Pan is the perfect cookware for you. This versatile pan has been designed to cater to a wide range of cooking needs, so that you can prepare delicious meals for your friends and family time and time again.